My ‘To Make’ list is getting out of control. In my mind, it’s sort of separated into two distinct categories. One is for recipes I stumble upon on the internet or in a book that really and truly whet my appetite. These are usually recipes like Ginger Scallion Noodles or Moroccan Red Lentil Soup that are fairly straight-forward and would easily slide into my weekly dinner routine. This category, while useful, isn’t as satisfying as the other, more terrifying category— Things Everyone Must Make At Least Once. Let’s call this the TEMMALO list. I’ve checked off fresh pasta and buttery brioche. I’ve tackled macarons and soufflé. And I’ve even made homemade marshmallows. But one item has been lingering on that list for far too long. 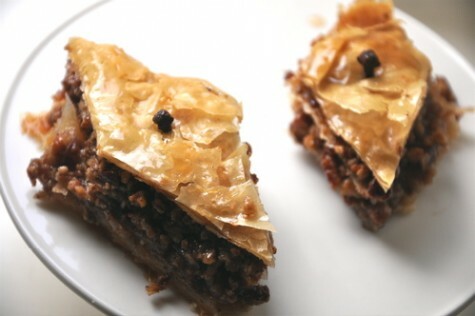 Baklava. Something about brushing endless layers of filo with melted butter, trying not to tear the papery sheets, just frightened me out of my wits. It is so complexly spiced and beautifully presented, I really thought it couldn’t be done at home. But I forged ahead for the good of humanity (hey, this was a true sacrifice!). The filo takes a bit of getting used to, but, like so many things, the repetitive motion becomes rhythmic and really almost therapeutic. This recipe is from the host mom of a friend who did her gap year at my high school, who, in my opinion, makes the best baklava around. To make the sugar syrup: Heat the honey, sugar, water, cinnamon stick, and the juice and rind of the lemon (seeds discarded) in a medium saucepan until sugar dissolved. Bring to a boil and boil for two minutes. Set aside. For the filling: Pulse the pecans in a food processor, careful not to turn them into nut butter, until finely ground. Transfer to a large bowl. Repeat with walnuts and almonds. Add sugar, cinnamon, cloves, and nutmeg and mix to combine. To assemble: Preheat oven to 300°F. Grease an 11x16x2-inch roasting pan. Open filo packages and lay on a clean surface lined with parchment paper. Cover with another sheet of parchment; lay a damp tea towel over top. 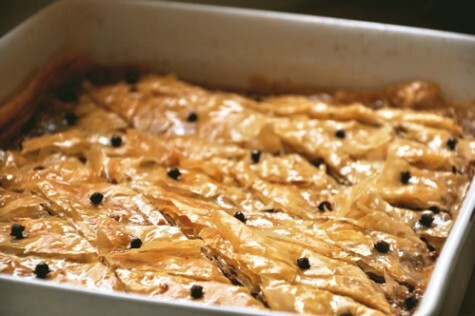 Lay one sheet of filo on the bottom of the pan and brush with melted butter, pressing out air bubbles. Repeat until you have a base of 25-30 sheets of filo. Sprinkle about 1/4 cup nut mixture over filo. Cover with 2-3 sheets of filo. Repeat until all the nuts have been used. Top with 10-20 more sheets of filo, brushing melted butter over each sheet. Refrigerate for 1 hour. Using a sharp knife, cut into 1-inch wide lengthwise strips, then cut across diagonally to make diamond shapes. Press one whole clove into each diamond. Bake for 1 1/2 hours until golden and fragrant. Bring syrup back to a boil and pour over warm baklava- it should sizzle. Cool before cutting. I'm Cooking For...: Christmas and Dinner Party. This is a very thorough recipe. Thanks will give it a go. Two pounds of butter? Definitely not a light recipe, but one certainly worth trying. This sounds fabulously…rich. It seems spicier than I expected. That makes it even more appealing. Thanks. Recipe sounds really good except for one thing. Pecans. True baklava does not contain pecans since they are a North American nut and therefore not available in the Middle East where baklava originated. Baklava is made with either pistachios, walnuts, or walnuts and almonds mixed. Baklava originaly was made with 100 hand made phyllo leaves. 50 leaves are acceptable for baklava now. I make baklava with 30 handmade phyllo leaves and it turns out great. You have to be able to read a newspaper through the pastry. Not a very easy task, but I enjoy making it for my family at Christmas time.